*SALE MAKE* Create some elegant jewellery with Swarovski dark rainbow crystals that glisten in rich tones of purple and green. 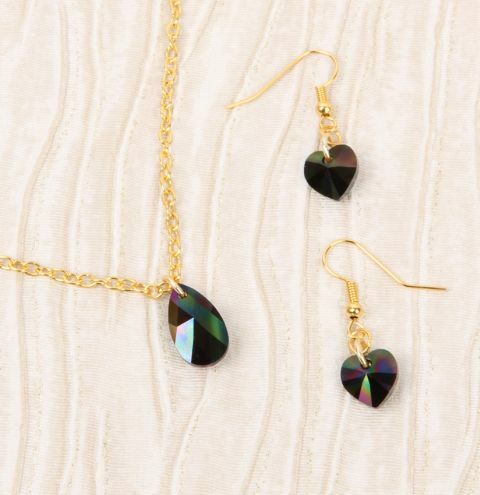 To make the earrings, open a large jump ring and close it onto the hole of the heart crystal. Attach a smaller jumpring to the previous one, and connect this onto an eyepin. Repeat to make the second earring. To make the necklace, open a large jumpring and attach it to the pendant. Cut a 16inch length of chain and thread it through the jumpring of the pendant. Finish the necklace by attaching a lobster clasp and jumpring to either end.